A huge milestone was recently reached at Eglin Air Force Base in Florida when an A-10C Thunderbolt jet took to the air running its engine on plant based fuel. The Air Force is the largest consumer of petroleum in the Department of Defense — they guzzle 2.4 billion gallons per year — and is hoping to wean themselves off foreign oil in the coming years. This flight was the first step in proving to their critics that measures can and will be taken to clean up the energy that fuels their aircraft. Terry Yonkers, assistant secretary of the Air Force for installations, environment and logistics noted that the Air Force’s goal, “is to reduce demand, increase supply and change the culture and mindset of our fuel consumption.” Air Force officials have announced that they’d like to have half of their total fleet running on alternative fuels by 2016 and make sure that all of their aircraft have been certified to operate on those fuels by 2012. The next test flights will take place later this year and will focus on huge oil eaters like the F-15 Eagle, A C-17 Globemaster III and the F-22 Raptor. Who does not want to take out the trash of society and help nature at the same time. To Troy, You are right, the Air Force probably doesn't care about hugging trees. But if an organization like this, with no mandate to protect the environment, can go fossil-fuel free, in a strange way that gives me more hope than a hand-full of do-gooders riding their bikes to work with the intention of saving the planet (by the way, I'm a do-gooder who rides a bike to work). Think of this as a laboratory for all of society. If the most energy intensive endeavors, like fuelling an air-force, can be done through renewable sources, then the kinks in the system will be worked out and released to the public in an optimised form. We fight bitter wars over fossil oil right now. When our tanks and fighter-jets are powered by dandilions, maybe it will demonstrate that the fight is now moot. The only down-side I can see to this is that there is no mention of how much energy is used in growing, harvesting and refining the camelina oil. If you need 1.5 gallons of fossil oil to produce 1.0 gallons of camelina oil, then we will still be fighting wars for oil, vegetable or otherwise. The plant used may not be a food source, but surely it takes up land that could be used to grow crops? Okay, so as a "weed" it can be grown on poor quality soil, but if you want to create enough of this stuff, you'll eventually use arable land. I'd like to think this is about environmental concerns, but being able to power military components without the need for foreign resources was probably sold more to the brass by concerns about being able to fight if someone cut off our oil supply rather than giving two chits about the trees and those who hug them. And on another very loosely related note... never noticed how much the A-10 resembles a mechanical Mickey Mouse from the forward view before. Well... if the (oil) wells run dry you now know who will still be able to shoot their guns. Yeah... yikes. A huge milestone was reached at Eglin Air Force Base in Florida on Thursday when an A-10C Thunderbolt jet took to the air running its engine on plant based fuel. 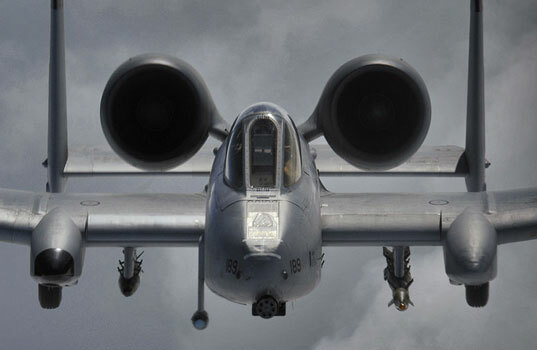 A huge milestone was recently reached at Eglin Air Force Base in Florida when an A-10C Thunderbolt jet took to the air running its engine on plant based fuel. The Air Force is the largest consumer of petroleum in the Department of Defense -- they guzzle 2.4 billion gallons per year -- and is hoping to wean themselves off foreign oil in the coming years. This flight was the first step in proving to their critics that measures can and will be taken to clean up the energy that fuels their aircraft. The Air Force is the largest consumer of petroleum in the Department of Defense -- they guzzle 2.4 billion gallons per year -- and is hoping to wean themselves off foreign oil in the coming years. This flight was the first step in proving to their critics that measures can and will be taken to clean up the energy that fuels their aircraft. Hydrotreated Renewable Jet fuel made from the camelina plant was used during the flight. The camelina plant is weed-like, needs little resources to grown and isn't a food source, making it a great option for biofuel. 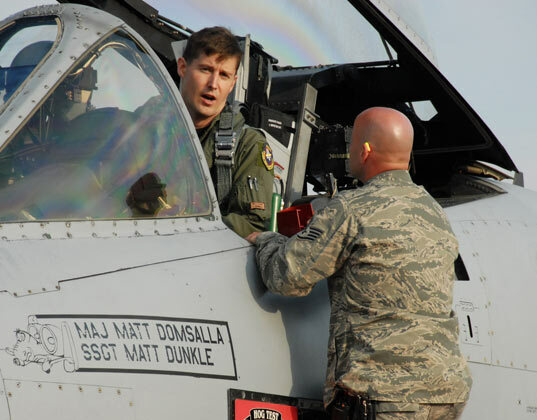 Fuel certification officials for the Air Force flew in from Wright-Patterson Air Force Base in Ohio to observe the flight. When he had finished his quick jaunt in the green aircraft the test pilot -- Maj. Chris Seager -- approached the officials and noted, "felt great, no problems whatsoever."